Raised in New York, New York, just walking distance from Fashion Avenue, Park Avenue and 5th Avenue, Dr. Thompson has always had a fine eye for aesthetic detail. This attention to detail is what led her to pursue a career in cosmetic dentistry. After working in Manhattan for a few years, she left New York to pursue her Bachelor’s of Science degree at The Pennsylvania State University. She earned a Doctorate in Dental Medicine from the Southern Illinois University School of Dental Medicine in Alton, Illinois. After graduation, she would return to New York to complete a residency at the Albert Einstein School of Medicine in the Bronx, NY. 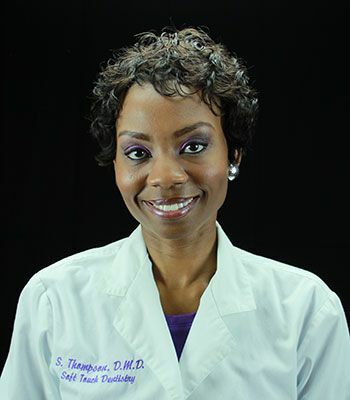 After finishing her doctorate and post-doctorate studies, Dr. Thompson entered private practice. She has been in solo practice for about 10 years and has owned her own cosmetic dentistry practice, just outside of St. Louis, Missouri, for more than 7 years. She is in the top 5% of cosmetic dentists, nationally, that hold a special I.V. sedation license in addition to a dental license. Dr. Thompson has placed thousands of veneers and crowns in the past decade of practicing cosmetic dentistry. She is very experienced in full mouth rehabs of patients with severely poor dentition. She is highly talented in her abilities to match tooth shade, tooth contour and tooth translucency in order to give her patients natural looking white teeth. Dr. Sarah Thompson is well-known in the St. Louis community and is very personable with patients that she treats. She is a proud member of the American Dental Association, the Academy of Cosmetic Dentistry, and the Academy of General Dentistry. Dr. Thompson has completed hundreds of hours of post-doctoral continuing education courses and holds numerous awards and certifications from around the country from Los Angeles to New York in various fields of dentistry, including Invisalign, I.V. and oral sedation, cosmetic dentistry, and general dentistry.